Do you know where it’s safe to cycle? In order to follow this recommendation, all bicycle promotion strategies need to ensure high-performance – but above all – safe infrastructure and user-tailored information about safe bicycle connections. For both, infrastructure and information, a sound data basis is needed. Geographic information systems (GIS) can serve as powerful platforms for consolidating and compiling digital data about the road network and the whole road space. This data basis can then be used for advanced modelling and analysis purposes. Starting point for any initative dedicated to improve bicycle safety is to assess the road network’s quality in terms of potential risks for bicyclists. Based on this status-quo analysis the existing infrastructure can be improved where it’s most needed and bicyclists can be informed about safe(r) routes. The indicator-based assessment model is different to generally applied assessment approaches. Click to enlarge. There are at least three approaches for quality assessment (expert evaluation, analysis of accident locations, user feedback) but each of them has several drawbacks – I’ll come back to this in another post. Different to these approaches we have developed an assessment model where we make use of geospatial modelling power. Conceptually this model is quite simple as can be seen in the figure on the left. The basic idea is to identify those “indicators” which contribute to the potential safety risk for bicyclists, such as presence and design of bicycle infrastructure or motorized traffic load. These parameters are then weighted and compiled in a GIS-model. For the identification of the indicators empirical studies are reviewed, experts and users are interviewed and accident reports are systematically analyzed. These sources also serve as proxy for the impact of every single indicator on the overall-risk, expressed as weight in the model. Depending on the environment (urban, rural), data availability or user’s preferences these weights can be easily adjusted. Finally all indicators with their respective weights are compiled in the indicator-based assessment model which can be applied to any road network. 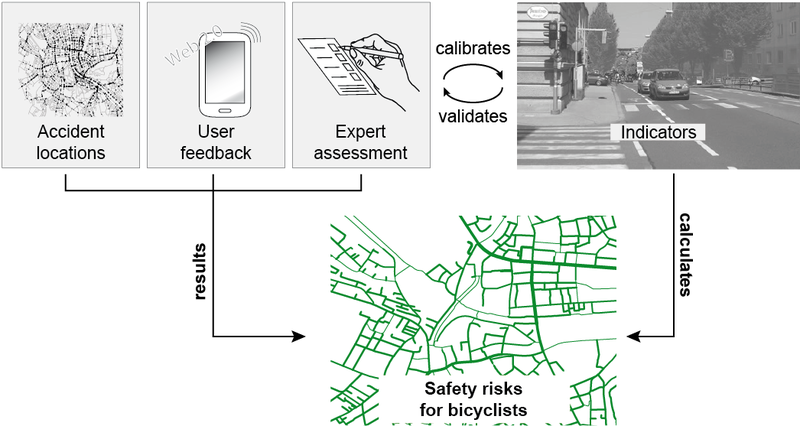 It calculates a dimensionless index value which expresses the suitability of every single road segment for bicyclists. Low values indicate a low safety risk and vice versa. Due to the linear design of the model indicators can be added or removed without affecting the model’s performance. Generally it can be said, that the more (non-redundant) indicators are used the better the explanation power of the model is. Conceptual design of the indicator-based assessment model. The list of indicators serves as illustration and is not complete. The indicator-based assessment model can be applied in any GIS for the calculation of the index value on a road segment level. The computed result is then evaluated by experts and users. If necessary, the model can be iteratively adapted either on the level of the indicators or the weights. Iterative workflow of model development, application, evaluation and calibration. Transparency: the results of the assessment procedure can be traced back to the building blocks of the model; all parameters and weights are accessible – there’s no black box or subjective component (as e.g. in expert evaluations). Comparability: the model is the same for the whole road network; thus the results, even on a segment level, can be easily compared. Adaptability: due to the linear model design and the implementation of weights, the model can be adapted to any environment, data availability or user preferences. It is transferable and geographically scalable. Reproducibility: Once the model is compiled it can be integrated in automatic assessment workflows. This allows for short update intervals and employment in simulation routines. If you wonder what this modelling approach can be used for “in the real world of bicyclists”, have a look to a really nice web application: www.radlkarte.eu . This routing platform is actually based on the described model. It’s quite innovative for at least two reasons. First, it is exclusively designed for bicyclists and has never been a car navi … The calculation of safe routes (for legal reasons they are called “empfohlene Route” = recommended routes) is a big deal especially for kids, elderly people or families. Second, it successfully shows the applicability of a rather sophisticated GIS workflow: different data sets with different data models are combined (OpenStreetMap and authoritative data from the city administration), the routing works across a national boarder (Austria and Germany) and the architecture of the systems allows for further adaptions (it is e.g. planned to implement personalized routing information). For the risk assessment of a whole road network, specifically for bicyclists, GIS facilitates pretty innovative solutions!